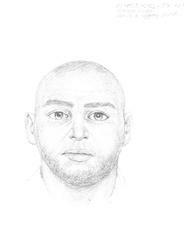 Synopsis: On 11/24/18, at approximately 1 a.m., a 14-year-old female victim sat on bench at Cabrillo Park when the suspect sat next to her. The suspect made small talk, which made the victim uncomfortable. As the victim attempted to walk away, the suspect brandished a knife and ordered her back to the bench. The suspect used physical force and verbal threats to keep the victim on the bench and proceeded to sexually assault her. The victim sustained multiple visible injuries from the assault.